Serves: 4 people Difficulty ': Easy Preparation time: 25 minutes INGREDIENTS 350g. 80g rice. 40g of butter. grated Parmesan cheese 1 shallot 1/2lt. champagne broth white pepper Peel and finely chop PROCEEDINGS -------------------------- scallions. In a saucepan, melt 40g. of butter and brown the chopped shallots until they become 'transparent. Add the rice and toast stirring with a wooden spoon. Pour the champagne and let it evaporate completely, continuing to stir. Bring the rice to cook, joining as a ladle of hot broth. 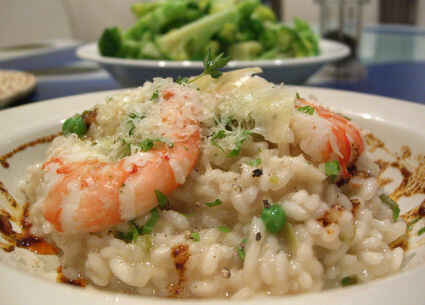 When the rice and 'cooked al dente, remove from heat and stir in the remaining butter and Parmesan. Pepatelo, let it rest for a few minutes and then put into a serving dish. Take him immediately to the table.